One visit and you get it. There are few places in this world that are as freeing as White Bay. Surrounded by the crystal clear waters of the Caribbean, white sand beaches and palm fronds dancing in the tropical breeze. Wake to the unmistakable beauty of the perfect sunrise. Chart a course of worry-free sun-filled thoughts listening to the perfect song as the sun fades on another perfect day. What a great idea to offer two rums that possess all the warmth and fun this island offers. 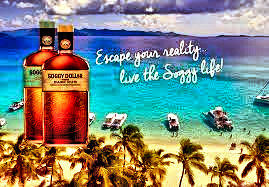 Soggy Dollar Dark Rum is triple distilled with natural cane sugar molasses and aged in oak casks to bring you a smooth rich flavor and deep golden color with notes of vanilla and caramel.